Dive in, the water's wonderful. 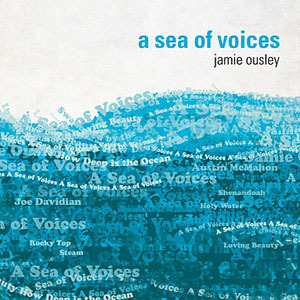 The nature of water is at the core of Jamie Ousley’s lovely new record, A Sea of Voices. The bassist, recently named the “Best South Florida Jazz Musician of 2011” by Boca Life magazine, plays with cordiality and fluidity. Ousley has assembled a beautifully balanced band for the recording, including pianist Joe Davidian and drummer Austin McMahon. Guest musicians include vocalist Nanami Morikawa, percussionist Carlomango Araya and pianist Gabriel Saientz. Ousley and his group play with a sense of wholeness, rendering each composition on the record a complete experience with no missing pieces. There are brave flourishes of piano and refined spots of percussion to help elicit the feeling of floating through seas of glorious blue, but there is also an unflinching spirituality that ensures that the pieces have a centre. This led Ousley to the Sunshine State Interfaith Power and Light organization, a group that allows the bassist the opportunity to expand on his love for playing jazz in churches while helping an environmental mission that is important to him. “Here, I could combine the worlds of diverse faiths and jazz to benefit a common cause that we can all unite behind: care of our planet!” Ousley says. Regardless of your faith or where you stand on environmental issues, A Sea of Voices is a beautiful piece of work. The songs come from assorted backgrounds, with the group tackling Ousley originals along with arrangements of Coldplay and Irving Berlin songs. Nothing sounds out of place or forced for a second. “Hymn of the Tides” is the first song on the album. Ousley’s composition is traditional and fairly direct, beginning with sustaining flourishes from Davidian’s keys and delicate brushwork from McMahon. There’s a cool and contemporary solo from Ousley that feels suitably thoughtful. My favourite piece is “Shenandoah,” a traditional number that blooms strikingly with Morikawa’s vocals. Ousley sets a sunken tone in the early going before switching to playing with a bow. And Morikawa’s ethereal vocals grow into a pretty delivery of the American folk song. I can’t say enough about the sparkling quality of Morikawa’s tone or her impeccable command over her upper registry. What a discovery! Ousley’s mastery of some wonderful songs is truly something, but his gift for making music that sounds invigorating and heartening is what makes A Sea of Voices a really special recording. This is the album to put on when one tires of the pompous nature that seems to lie in the mechanical guts of some of today’s more Dotty acts. This is an album of hunger and spirituality, as revitalizing and refining as water.